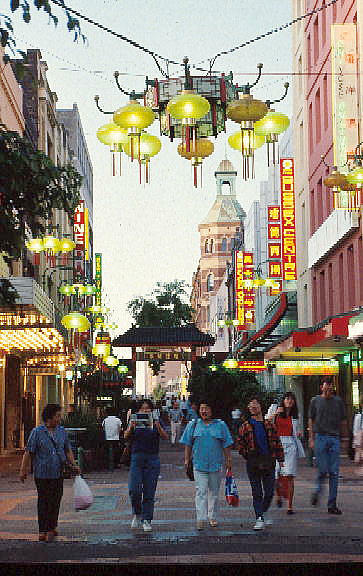 Sydney's main Chinatown is located on the south-western fringe of the traditional CBD. Since it's humble beginnings in the early half of the 20th C. where mah jong parlours and opium dens were basically only known to the Chinese. The precinct has now become an integral part of the city. Dixon Street has always been the tradtional centre yet as Sydney's boundaries bust at their seams, it has stretched for quite a few blocks beyond to become just as visible as any other entertainment area in or around the downtown areas. Guess it's not just an American thing, LOL! Detroit bulldozed their Chinatown to build the Lodge Freeway in the 1950s. Let me see if I can find some pics from the pre-Lodge days. The remnants of Chinatown, 1970s. One Chinese restaurant managed to hang on until 1999, when it also closed. Because it was much easier to put a freeway through a minority neighborhood like Chinatown or Black Bottom than it was to put it through some rich white neighborhood. Chinatown got cut in half by the Lodge. It never recovered, since the Chinese never restablished the area. The city tried to help by creating an area where a Chinese open air market could occur, but that never took off either. Providence doesn't have a Chinatown. But a popular story has it that former mayor Cianci visited San Francisco's Chinatown and was so impressed he ordered one of his aides to begin work on building a Chinatown in Providence. Only problem, there aren't that many Chinese people in Rhode Island. Boston's Chinatown was servely impacted by the construction of the original Central Artery through the city. The city's red light district also set up shop in Chinatown after it's old location, Scollay Square was cleared to make way for Government Centre. The red light district was known as the Combat Zone and for years, the Combat Zone and Chinatown were virtually synonymous. Today Chinatown is experiencing a bit of a renaissance with the burying of the Central Artery and the creation of the Rose Kennedy Greenway, Chinatown is becoming a hot area for developers. It strikes me as funny to want to "build' a Chinatown. Most Chinatowns were developed gradually by Chinese people living near eachother and thus creating a demand for Chinese restaurants, shops, etc. Cianci was a funny guy. I don't think it's that weird to want a chinatown, or even encourage it's development. They make popular attractions in a lot of cities, and the added diversity is always a plus. In Ft. Lauderdale they're working with China to create a China Trade Zone which will in effect be a "chinatown" with shops, residences and import/export facilities. Miami could use a Chinatown. There's quite a few asians around, but most of them are spread out through the suburbs. Here's a little of the Chinatown in Honolulu, i think it used to be the oldest in the US at one time until they burned the whole thing down because of the bubonic plague but its still one of the oldest, the first Chinese arrived in Hawaii in the yeat 1789 way before they settled on the US Mainland or Canada. Hawaii was a huge gateway for many of the first asian and pacific islander migrants to the US. BTW Honolulu's Chinatown is a lot different looking than other Chinatowns it doesnt have all the large signs or bright lights as they wanted to preserve the original feel of the place and billboard type signs are illegal in Hawaii. Honolulu's Chinatown is also very mutlicultural as there are many korean, filipino, thai, laotian, vietnamese, indian, hawaiian, samoan, etc businesses there too. Nearly every city in Canada has a Chinatown though, even Victoria (metro population 300,000). A lot of those places wouldn't make sense to have a Chinatown. I mean, Buffalo? C'mon. And Miami is obviously more spanish/caribbean inspired. Edit: Oh yeah and Victoria is right across the... bay? from Vancouver, which, as I'm sure you know, has the highest Asian population outside Asia. ^I doubt that or did you mean to say percentage wise? Cause in raw numbers try places like LA, SF, NYC. Haha, that's laughable. I see nothing asian-inspired there, except that roof, which is pretty mediocre. I have never exactly heard of one city having two Chinatowns, but Houston has the real chinatown just east of downtown. Another "Chinatown" is located out in the westside of the city in the Alief district. Toronto has two Chinatowns in it's downtown (they're a little too seperated to be considered one), and a third about a mile East of downtown. Yes, but even Winnipeg (metro pop. 700,000), which is nowhere near any major city with lots of Asians has a Chinatown. The point being Winnipeg has a smaller Chinese population than other cities that don't have Chinatowns. The only 500k+ metro that might not have a Chinatown is Quebec City. Urbanrailfan, NYC has more than one Chinatown i think LA does too. Here in Honolulu our newest immigrant waves are the Micronesians which eventually other parts of the US will end up seeing a large number of them, Hawaii is like a stepping stone for many of the first Pacific Islander to Asian migrants to the US and this is the next batch. I think the latest estimate for the Micronesian pop in Honolulu is like around 20,000, they have become very noticeable very fast and already subgroups like the Marshallese and possibly the Chuukese have already out grew the Tongan population which has a history in Hawaii dating back a 100 yrs. The Micronesians seem to be scattered though but there are area's that certain ethnic groups tend to rotate too like the majority of Palauans seem to live just east of the the CBD, the Chuukese in Kalihi, Palolo, and Makiki the Marshallese in Waipahu, Makiki, the Kosraeans in central Honolulu, the Pohnpeians central Honolulu to Kaimuki, etc etc this wave has brought like 20-30 different languages/ethnic groups so it has put a strain on resources and there's a huge need for interpreters and people that are familiar with their cultures. South of Boston the city of Quincy (which is at the southern end of the T's RedLine) is attempting to develop a sort of Chinatown around a Chinese Mall. Boston's Chinatown has become quite pricy so a lot of the smaller shops are moving out of the city, Quincy has a small nexus of Chinese shops that it is trying to build on. New York's Chinatown in Flushing has been growing as people are priced out of the Manhattan Chinatown as well. I think though immigrants are tending to settle in the suburbs as much as the cities, we'll still see a need and desire for ethnic enclaves. I've known many suburban Chinese who frequently go into Boston or New York's Chinatowns to make purchases that can't be made in the suburbs, and simply to socialize. The economies of scale make it difficult to have everything available to a spread out population, having a central city location where people from all over can converge to shop allows merchants to make things available that wouldn't be economically feesible for shops with a less concentrated customer base in the suburbs. So why would being spanish influenced take away from us having a chinatown? I don't know the numbers, but I see a large number of Asians here in Miami. Most of them are middle class suburbanites. They don't need a chinatown. It's ture we're more carribean inspired, but I don't really see what that has to do with it. We also get a lot of asians via latin america and carribean. There's a Japanese-Brasilian here at work, and quite a few Jamaican/Chinese and Trinidadian/Chinese people here. It makes for some interesting dining options with Chinese/Cuban and Jerk/Chinese being popular in some places. I don't see what's so wrong with the mall. Oh and Orlando has a rather large Little Saigon neighborhood. Actually, middle class suburbanites are amongst the best purveyors of chinatowns. Of course no one "needs" a chinatown, but any city is better off with one than without one.